Parents- Please Don’t Let the EpiPen Price Increase Keep You from Using Them! I teach a lot of CPR and first aid classes, as part of my Adventure Workshops and locally to raise awareness of the need to be prepared for medical emergencies. I enjoy teaching them, because it’s how I got started speaking professionally. It’s also a way for me to give back, by hoping that someone I teach will pass it on by helping another. 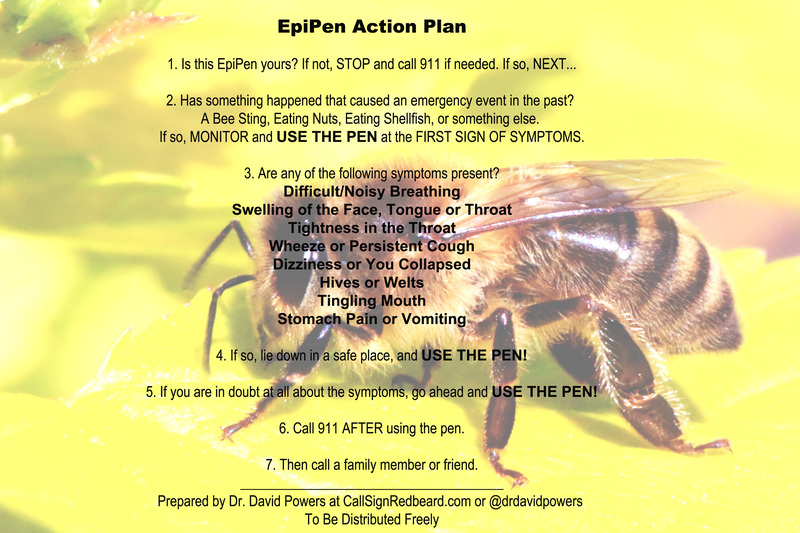 One of the key tenets I teach in my class is the ability to properly use an EpiPen. It’s not just learning the how, though. It’s also about being WILLING to use it. People are simply scared to death that they’ll hurt someone, use it improperly, or use it at the wrong time. Unfortunately, now due to the price jump of EpiPens, you’ll find many people will also be afraid because of the cost. PARENTS- Please try not to let this affect your decision to use one. EpiPens are a life and death treatment. If your child or someone else needs it, it means that they will likely die if you do not use it. One thing I’ve found that helps in emergency situations is to use an algorithm. It’s simply a checklist of events and procedures that helps remove the stress, doubt, and fear from a situation. You’d think it would be easy to find one of these online or from your doctor, but it’s not. Most of them are either way too wordy or written only for medical personnel. Even Mylan, the company that makes the EpiPen, has a set of guidelines that is useless for someone in an emergency situation. I created the image below just for you. It’s mainly for parents, schoolteachers, or friends of kids who have EpiPens. Feel free to print it off, share it, give it away, or whatever you need to help spread it around. Be sure that you print out your own and keep it with your pen. You can even rubber band strap it around the pen itself.